Sales of Windows 8 may have struggled out of the gate, but 90 days since its October launch, Microsoft has indicated it's moving enough new operating system licenses to equal that of Windows 7. 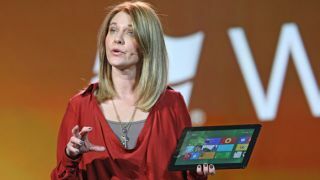 "More than 60 million licenses sold is on par with the record setting pace we saw with Windows 7," said Microsoft Chief Marketing Officer and Chief Financial Officer Tami Reller in an official Windows blog interview. That figure has been aided by a Windows 8 Pro upgrade discount for US$39.99, a deal that expired on February 1. The new price is US$199.99. Microsoft has also given Windows XP holdouts a chance to upgrade, skipping over Windows Vista and Windows 7. This convenient policy continues. Reller said in the interview that there's still more to do after Windows 8's three-month milestone, and users' demand for touch is something Microsoft and its partners will pursue. "Together, we've made progress and the trajectory of touch devices continues to grow," she said about the importance of breaking down the boundaries between PCs and tablets. "From tablets, to touch laptops, to all-in-one PCs, customer interest in new touch form factors is increasing." In addition to driving touch, Windows 8 users have been downloading a steady number of apps. Reller noted that the Windows Store reached the 100 million mark in the first 60 days. While not everyone is making apps for the Windows Store, she said that the number of apps available has more than quadrupled since the launch of Windows 8. Reller pointed out that the Windows Store allows app builders to use their own commerce engines and keep 100 percent of their in-app sale profits, a subtle jab at Apple's policy. With Windows 8 engaging users with 45 billion unique live tile updates as of early last month, the new operating system is keeping pace with Windows 7. However, it may take hardware, like the upcoming Microsoft Surface Pro or or a rumored Surface 2 tablet, to really give the operating system a jump start versus the previous OS.